Today only! A Poe t-shirt! Posted on February 7, 2011 by Corvid GyrlLeave a comment on Today only! A Poe t-shirt! 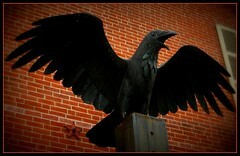 “The Raven” is a narrative poem by the American writer Edgar Allan Poe, first published in January 1845. It is noted for its musicality, stylized language, and supernatural atmosphere. It tells of a talking raven’s mysterious visit to a distraught lover, tracing the man’s slow descent into madness. The lover, often identified as being a student, is lamenting the loss of his love, Lenore. The raven, sitting on a bust of Pallas, seems to further instigate his distress with its constant repetition of the word, “Nevermore”. The poem makes use of a number of folk and classical references. Poe claimed to have written the poem very logically and methodically. His intention was to create a poem that would appeal to both critical and popular tastes, as he explains in his 1846 follow-up essay “The Philosophy of Composition”. The poem was inspired in part by a talking raven in the novel Barnaby Rudge: A Tale of the Riots of ‘Eighty by Charles Dickens. The first publication of “The Raven” on January 29, 1845, in the New York Evening Mirror made Poe widely popular in his lifetime. The poem was soon reprinted, parodied, and illustrated. Although critical opinion is divided as to its status, it remains one of the most famous poems ever written.